“And the time came when the risk to remain tight in a bud was more painful than the risk it took to blossom.” – Anaïs Nin. When I look at the geranium blooming in my office, there is no doubt the days have gotten longer, and the light stronger. No longer starved of what it needs to thrive, the plant looks enriched with more energy. Now the geranium is beginning to stand at attention, rather look wilted and stilted. Even humans, in springtime, have a renewed sense of spirit. We’re ready to spend more time being rejuvenated, creating, celebrating and growing from the inside out. I’ve been reflecting that a little more than a year ago, I started writing my first full length piece. The writing has gone through about six revisions, and with it, so have I. Each time I have changed the text, there has been a thought process to evaluate whether the words match the message I had in mind. Alone, the exercise in writing has been valuable. But, it has also been an investment in learning more about my own self and what I have to say. Like the geranium that sits inside in my office, waiting to be put outdoors when the conditions are right, there will come a time when I will need to release the book. Then a whole new dimension will be added to the self-discovery process. If I I have adequately blossomed and grown, I’ll be able to spread my message through the spoken word also, about all the things I’ve been writing about. I am looking forward to the next step in independent publishing. 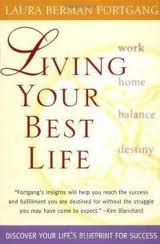 Living Your Best Life , by Laura Berman Fortgang, is a wonderful book that can help you to begin your journey toward feeding and nurturing yourself with what it takes to live a healthy, happy life. It is a good springtime read for those who want to invest in changing or rebuild their lives during this season of new life.